Tanya Blake... in fine form ahead of GSSE 2003. Malta GSSE gold medal hopeful, Tanya Blake, has hit top form ahead of the Games next week as the middle distance runner established a new national mark in the 800m last weekend at the Prefontaine Classic Grand Prix meeting in Oregon, US. English-born Blake, who holds a Maltese passport, clocked one minute 59.56 seconds to place fourth in the star-studded race which was won by world and Olympic gold medallist Maria Mutola of Mozambique in 1:57.98. Jearl Miles Clark (1:58.61), of the US, placed second ahead of Canada's Dianne Cummins (1:59.41). Blake, 32, finished ahead of much fancied US trio Jen Toomey (1:59.75), Regina Jacobs (2:00.1) and Sasha Spencer (2:01.56). It was the first time ever that Malta was represented in this prestigious meet which produced an astonishing 11 season's best performances on a cloudy, warm afternoon. The Prefontaine Classic, now a long standing tradition, has only nine events (men and women) where some of the best athletes are selected from various countries around the world, depending on their current performances. Among those invited were Mexico's Ana Guevara, who outpaced Cathy Freeman of Australia in the 400m event, and Jolanda Ceplak. The Slovenia runner won the 1,500m race in a national record of 4:02.44. Stacey Dragila, of the US, then equalled the year's best women's pole vault, clearing 4.62m, to win her early-season showdown with indoor world record holder Svetlana Feofanova (4.52) of Russia. The men's events featured St Kitts sprinter Kim Collins, who won the 100m event in 10 seconds flat, Kenya's trio Bernand Lagat, winner of the mile race, and Abraham Chebii and Ben Limo who placed first and second respectively in the 5,000m. Blake was expected to join the Malta GSSE team earlier this month but had asked to delay her arrival to travel to Oregon after receiving an invitation from the Prefontaine Classic organisers. She will be here this week. At the Matthew Micallef St John track in Marsa, Blake is expected to take part in the GSSE 400m, 800m, 1,500m and 4x400m events. 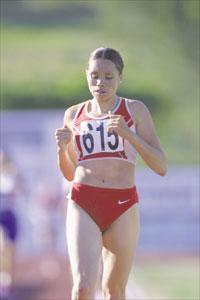 In the San Marino Games, in 2001, Blake had struck gold for Malta in the 800m, also setting a GSSE record at the time of 2:06.26. She had bettered that timing consistently, a few weeks ago lowering it to 2:01 in another meet in the US. The women's 800m race will be the curtain-raiser to the track and field events in the GSSE programme. Her result in Oregon is indeed a good omen and a much needed morale boost for the rest of the athletics' squad.